A good diet can be easy and enjoyable to maintain. Develop a nutritious and adequate diet including a range of foods and food groups. Minimise your fat intake. Saturated fats are the worst and should be avoided. Cholesterol (found in most fats) should also be avoided by most people. Limit your salt (sodium) intake. Eat a lot of fibre and complex carbohydrates (the bodies main source of energy - found in grains, greens and vegetables) as possible. Determine and achieve your ideal body weight. Just finding a tasty alternative to fatty poor foods can be difficult. pure+natural tries to provide a healthy alternative? always! The key to healthy eating is a wide range of nutritious foods. Plenty of fresh vegetables and fruits, lots of bread, rice, pasta and other grain products, along with reduced fat dairy products, fish, lean meat and poultry. 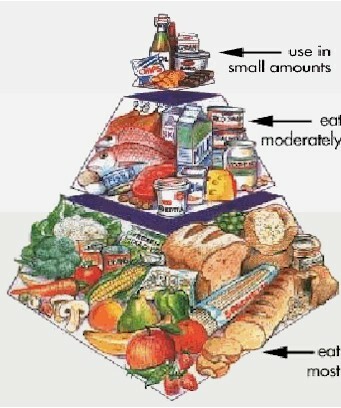 The Healthy Eating Pyramid shows how to eat to manage your weight. It also offers food in the right amounts to allow you to remain in good health.